I have been toying around with the idea of creating small videos on various JDM topics for a while now and put that into action a few weeks ago. 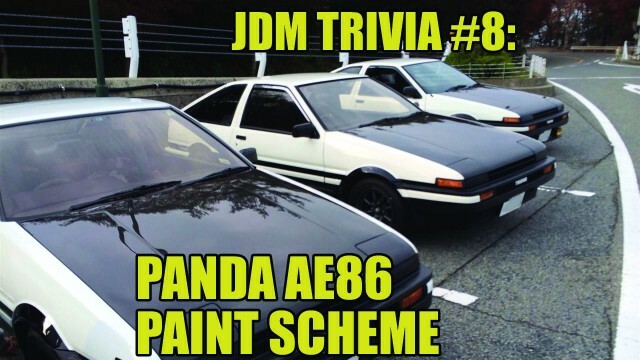 The latest video, number 8, I made one about the panda AE86 paint scheme. I tried to cover all the necessary aspects of the panda AE86 paint scheme and make a good, clear story about it in a four minute video. The panda paint scheme is actually far more subtile than you think: the paint is not 100% straight at the front bumpers and fenders, and stays very close to the inverted side mouldings. Then at the rear it swoops up on the hatchback, while it remains straight on the two door. The reason for this is clearly the way the tail lights are placed: the hatchback has wider and thinner tail lights that were placed lower due to the hatch. The two door has more square shaped tail lights and placed higher due to the bootlid ending much higher than where the hatch would meet the tail lights. To make the design work, the two door has higher placed tail lights. The difference of the panda AE86 paint scheme bewteen the zenki and kouki Levin isn’t that big. In general the shape is similar and follows similar lines on the front bumper. There are quite a lot differences between the zenki and kouki Trueno and it looks more similar to the kouki Levin. The reason is that the front bumper changed in design and this means only the top of the bumper is inverse, while the remainder is black. I have used a couple of videos from Toyota, Motorweek and many photos from various websites (mostly Minkara and AEU86) so if you feel your photo has been left out and needs crediting, let us know in the comments below!